I was doing a routine yard check two weeks ago when I noticed an unusual amount of traffic in two hives, primarily back and forth–not good. It was late in the afternoon, a warm, drizzly 50 degrees, and the bees should have been tucking themselves in for the evening. Instead, these two hives had an insistent, energetic buzz going between them that had all the earmarks of robbing. I had swapped my robber screens for mouse guards when the weather got colder; the six hives clustered in this yard for the winter were protected from rodents, but not from each other. I spent an evening modifying my standard entrance reducers with a bit of scrap hardware cloth. The reducers went on the hives the next morning. This weekend’s visit found one of the hives cold and quiet. Further inspection revealed plenty of stores (even after what must have been extensive robbing, given the amount of wax debris that fell through the screened bottom), but no brood of any sort and just a sparse handful of dead bees on the bottom board, some fresh, others old and moldy. This colony went into winter exceptionally well-stocked, perhaps the heaviest in my yard. In October, it had a 2012 queen that had produced a compact, solidly-laid brood area. It also had a fairly high mite count and summered in an area of the property with a high probability of winter flooding. 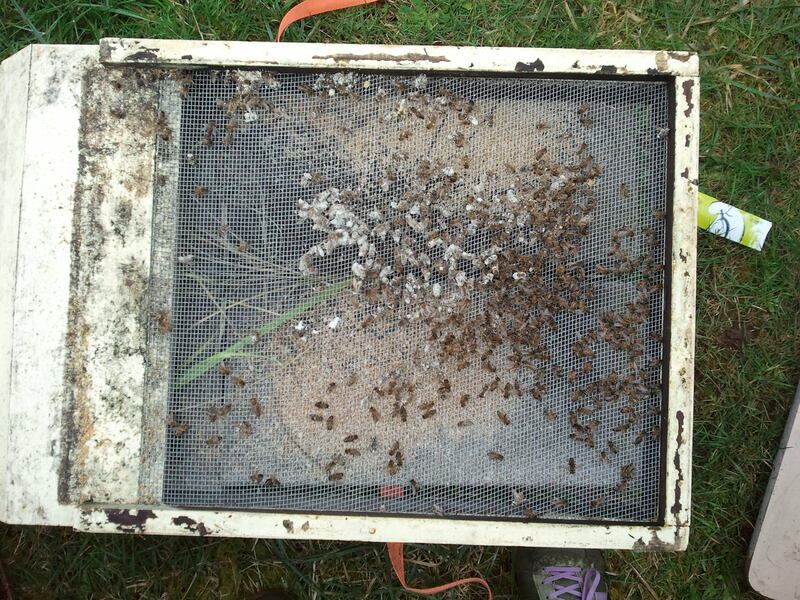 There are several decisions I made, none of which would I necessarily recommend to others, that could have affected the outcome of this hive: 1) I went into winter with an older queen, 2) I allowed the colony to carry a high mite load, and 3) I was compelled by high water to relocate the hive from a low bee population area to a higher one, increasing its exposure to robbing. The decision to move the colony was a necessity. My other choices were made because I am attempting, in an amateurish way, to arrive at queen stock that is both long-lived and mite-resistant. I left this colony as it was because it was so productive and had produced such an economical, well-organized fall cluster–wonderful attributes that unfortunately in this case did not translate into a successfully overwintered colony. While the death of this colony was probably due to an aged queen or mite-related issue, I’ll continue to keep an eye out for robbing as long as the mild winter weather allows the bees to fly.